I bought these with intention to use for feeding and sticking to a high chair but they don’t stick at all! If they do stick my daughter just pulls them up! I like the fact that I can store them really neatly and they don’t take up space as they stack inside each other. I mainly use them to store food in as they have an airtight sealed lid with each one. So overall gray for storage but not for sticking! I brought these thinking that the suction would hold on my sons highchair tray... It doesn't. With a few light pulls he manages to take it off the tray. These came in a set 3 bowl ranging in different sizes and although they may not work as I'd hoped they would I still find them perfect for taking out with food and snacks. Handy little pots that have a useful suction feature on the bottom. This ensure messy little eaters cannot throw their meals on the floor. Cheap and functional, as they also come with lids. Sticks to the table or high chair so baby can’t knock over. We’ve just started weaning and these bowls are great. Useful for pre prep/storing food in the fridge and for when we’re out and about as the lid is very secure. Also microwave safe so can heat up food. Best of all they stick to the high chair so my little one can’t knock it off... which he likes to do! I used these when my son was starting to feed himself so he had more control when putting the spoon in the bowl. It helped so much as the bowl did not tip every time he tried to get a spoonful. They are also ideal for putting snacks in and the suction on them is very strong! They are easy to wash and are very colourful. 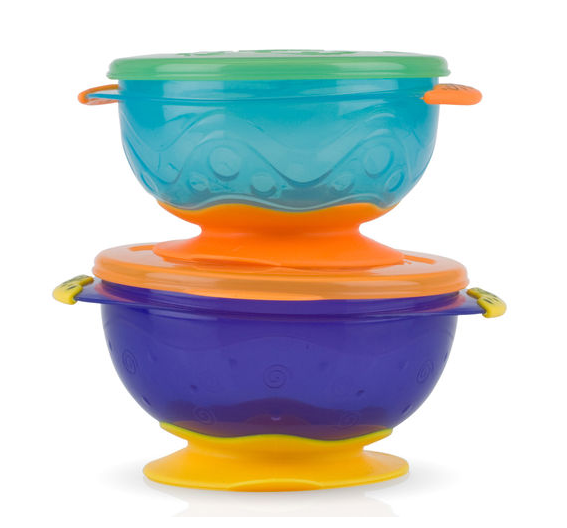 Very eye-catching design and colours, that keep LO entertained during self-feeding. Suctions is pretty good and secure. Also, my LO loves the little ball-shaped ends on the cutlery. I was concerned that it would be impossible to stab food with the fork as it has rounded edges, but I was pleasantly surprised. I will be buying another one. 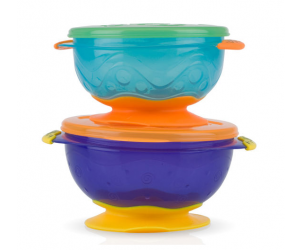 The Nuby Stackable Suction Bowls set includes two colourful bowls with seal tight lids and a super suction on the base, so the bowls stick onto most tables. 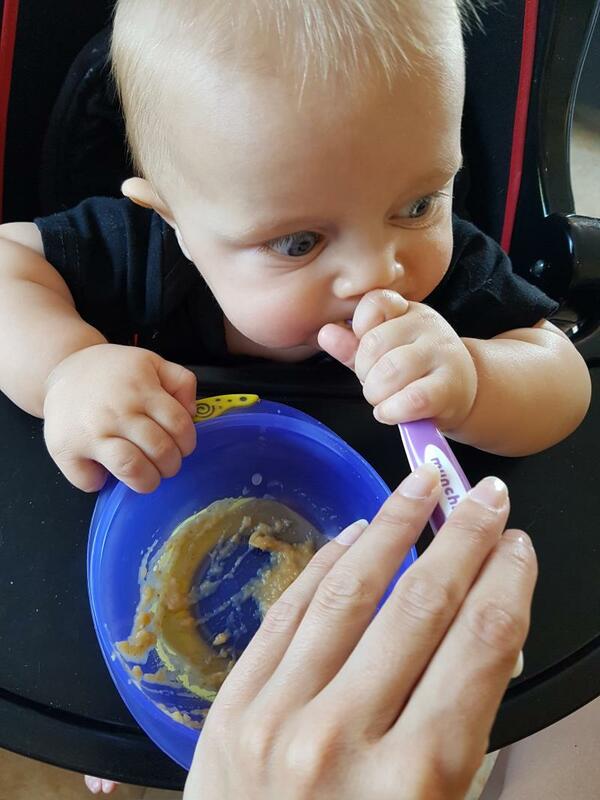 The bowls are designed with an easy grip, ideal for little hands.